After the huge (according to GitHyp, almost 0.5 million tuned in on Twitch) and sudden reveal of Cyberpunk 2077’s 48-minute long gameplay demo, the developers have continued answering fan questions via different channels. 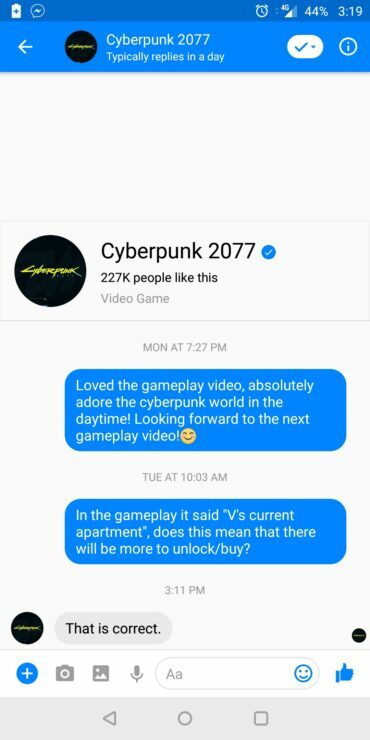 For instance, a Reddit user posted the snapshot below of a conversation with the official Facebook page of Cyberpunk 2077, where the employee from CD Projekt RED confirmed that the game will feature multiple apartments to purchase and/or unlock, much like Grand Theft Auto games. Another major source of Cyberpunk 2077 news is, of course, CD Projekt RED’s official forum. Replying to a thread where users discussed the viability of solo without companions like Jackie from the gameplay demo, Senior Quest Designer Philipp Weber (whose username on the forum is Benzenzimmern) explained that there won’t be an actual companion system as in other roleplaying games. The developers will instead occasionally pair the protagonist, V, with specific companions during certain story quests, just like in The Witcher. We’ll keep you updated on any further details shared by CD Projekt RED on the hugely anticipated game Cyberpunk 2077.